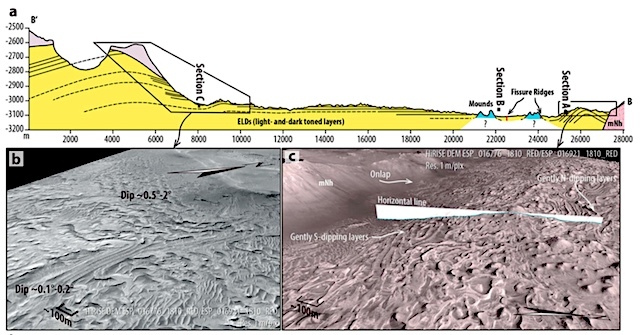 Light‐toned layered deposits rich in sulfates are widespread on Mars in several locations. Understanding how these deposits formed is crucial to infer the climatic conditions during Martian history and, in light of the fact that potentially similar deposits on Earth have been shown to be conducive to bacterial life, is critical in the search for habitable environments on Mars. We focused on Kotido crater because it shows a remarkable infill and excellent data coverage. We drew a detailed geological map, recognizing subunits interbedded within the layered deposits: light‐toned and darker‐toned layers, subconical mounds, and associated fractures. This entry was posted in Reports and tagged Arabia Terra, equatorial layered deposits, goundwater, Kotido Crater, sulfates. Bookmark the permalink.